Abdool Kader (Baboo) Essa joined his father, Haroon Essa, at Frimax Foods, straight after completing his matric. He was told by his family that he would "attend university at Frimax", their family owned business. His brothers, Shamir and Faizel Essa, also joined the business after they completed their schooling. 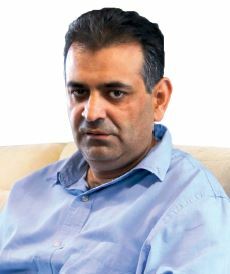 Established by Haroon Essa in 1982, Frimax Foods has been in operation for 36 years. Based on humble beginnings in Pietermaritzburg, KwaZulu-Natal, Frimax has grown from strength to strength and is now considered one of the fastest growing potato and corn snack companies in South Africa. Baboo Essa said, "As a family owned business, there was a need to learn all aspects of the business and so I was not put into any particular division. However, I found marketing interesting and got involved in visiting clients and selling the product for the retail market." During his school years, he had already spent time on the factory floor after school - supervising the dispatch of goods and loading on to trucks, reading consumer mail and assessing call logs, even working as a machinery operator, and frying potatoes. He has since taken on the role of managing director of the business and keeps an eye on the company's finances. When he started at Frimax, the company was supplying a housebrand to a larger retailer and he was proud of their achievements. However, he said, "But after receiving a negative response to the housebrand from a consumer columnist, we decided to change our strategy, stop their production, and concentrate on getting our own brands into stores. Initially, as an eighteen year old, this was very disappointing for me, but I realised we needed to start batting for our own wicket." At that time Essa was also required to meet with a major buyer in Cape Town. He said that he was really disheartened, when after the client had eaten a full packet of Frimax chips, said that he was not going to stock their products at that time. However, said Essa, the sales representative, who had accompanied him on the visit, said that he was not to worry. "Soon afterwards, I was hugely excited to obtain a half a million rand order, which even by today's standards was huge. From that point on we started to move forward more rapidly. I have learnt not be disappointed if the first meeting with a client does not go your way and to always be hopeful." While Baboo Essa has always dreamt of growing Frimax bigger, the increasing demand for their products has taken him by surprise. The brothers are now at a point that in order to grow the company further, they would require larger factory premises. Apart from the national footprint, Frimax Foods exports to various African countries and Indian Ocean islands through different channels. Baboo Essa says that he and his brothers learn every day in the business. "Frimax spends a lot of time in research and development, a recent challenge has been complying with salt regulations that has required the use of replacement flavours, which are more expensive - we are still trying to get the Mexican Chilli flavour right." He commented that the South African population is getting more educated and is changing. Consumers are more health conscious and affordability is always an issue especially when it comes to snacks. "An important aspect of the business is offering client value, which is why we have never decreased the size of our portions and still sell 150 gram packets. A lot of our product is sold in rural areas, so it is important to provide a product that is both filling and affordable." The company has a loyal range of customers in KwaZulu-Natal, and in the Free State, Frimax is considered the second best snack brand. Frimax Foods has embraced the concept of continuous improvement within its production facility, and has constantly strived to increase product quality, whilst at the same time reducing overhead costs. The organisation also attempts to reduce its carbon foot print on all levels. As far as possible, natural gas is utilised in the production plant to fire up the fryers, ovens and burners, as opposed to the use of electricity or diesel. Baboo Essa concluded by saying that snack foods is an exciting industry to be in and that the highlights of his business career has been in receiving business awards and recognition. Frimax has receive the Shoprite Checkers Best National Supplier Award repeatedly, and an Institute for Quality award recognising its contribution to skills development.